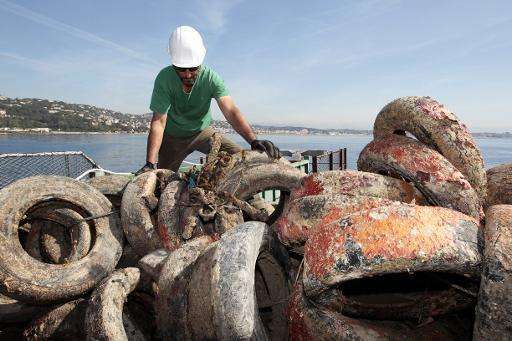 Tourists and film stars hitting the beach at the French Riviera resort of Cannes may be blissfully unaware but lurking beneath the sparkling waves are tens of thousands of now troublesome scrap tyres, sunk deliberately to boost marine development. Back in the 1960s, it seemed like the ultimate win-win idea: sink tyres into the sea and create artificial reefs, stimulate marine life, help the fishing industry and get rid of unwanted scrap in one fell swoop. But decades later and after millions of tyres have been sent to the deep, authorities worried about pollution are starting to reverse the trend and haul the tyres back. 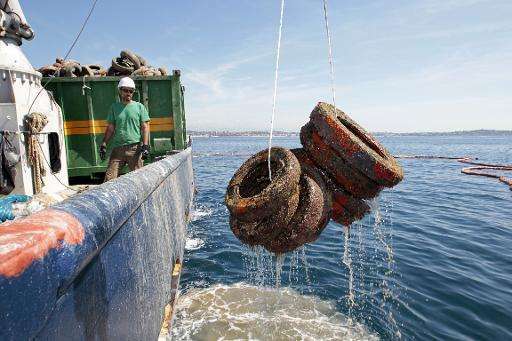 On the French Riviera coast, authorities have just started an operation to remove around 2,000 tyres, a pilot scheme that could be extended to reclaim all 25,000 tyres under the sea between Cannes and Antibes, another posh resort, next year. France was by no means alone in thinking this was a good idea. 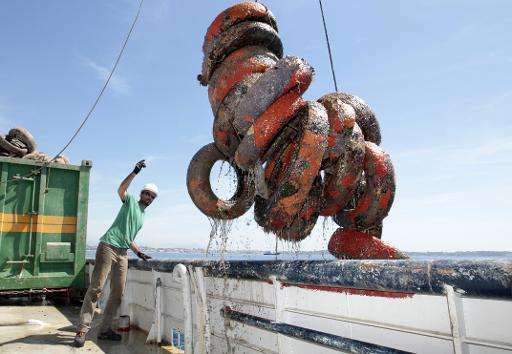 According to scientists, around 200 artificial reefs made of tyres are in existence worldwide, notably in waters off the United States, Japan, Malaysia and Israel. The problem has been that the tyres have been dragged around by the currents and in many cases broken up, damaging the ecosystem and failing to attract the marine life expected. "If colonisation never took place, it's because the used tyres are covered with hydrocarbons. When they break up over time, they release heavy metals into the environment that are toxic for marine life," said Jacky Bonnemains, from the Robin Hood environmental pressure group. 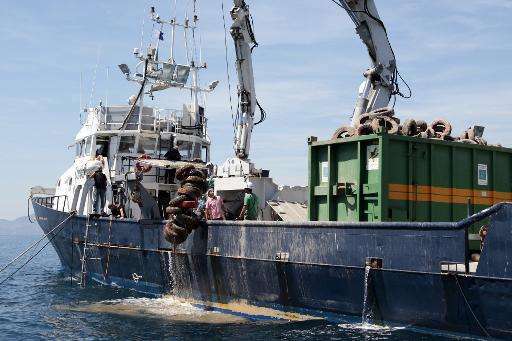 The French agency in charge of protecting marine areas, based in the port of Brest in the northwest Brittany region, aims to "restore" the habitat by removing the tyres. It stresses, however, that when they were sunk, they were thought to be "completely inert" and present no possible danger for the environment. Unfortunately, in addition to the environmental impact, the hoped-for results in terms of sparking marine life also failed to materialise. Tyre reefs were 40 percent less efficient in terms of colonisation than similar concrete artificial reefs, said the agency. Creating artificial reefs is nothing new—even 3,000 years ago, the ancients were dropping rocks into the sea to attract fish. And France is by no means the world leader in the activity. There are an estimated 90,000 m3—about the size of an ocean-going cargo ship—of artificial reefs made of tyres in France compared to around 20 million in Japan. The United States has more than 1,000 artificial reefs along its coastline and around two million tyres were sunk off the coast of Florida in 1972 in an attempt to promote marine life. The idea came from tyre giant Goodyear. "Goodyear came along and said 'that will be useful to fishermen and the sea.' They were trying to give a veneer of usefulness to the deliberate dumping of waste in the environment," said environmentalist Bonnemains. However, in Florida as elsewhere, the tyres became detached after storms and currents and washed up on beaches causing environmental damage and also—ironically—harming the natural coral reefs. Florida's state environmental agency describes it as a "serious" threat and launched a programme to begin removing the tyres in 2007. But with so many tyres to deal with, even the agency in Florida admits the "complexity" and the "scale" of the challenge ahead. That this concept was thought of and promoted by Goodyear should have rung alarm bells, even back in 1969. So Goodyear is paying for the cleanup? The world is full of scum. When the giant Michelin man pops out of the ocean and attacks New York, will France send a group of commando's to help save us?